I’m still chugging my way through my blocking pile. Here’s my Jang Print ‘o Wave piece, finished and blocked. I admit I could have done a better job blocking the thing, but it’s not horrible. Due to the yarn and needle size I used, it ended up being stole sized rather than conforming to typical scarf dimensions. As I noted in my earlier posts, the endorsed rate of attachment is a bit ruffly. I prefer a flatter piece. The corners however turned out better than expected. The ease factor I used was (for the most part) enough to flare nicely around the corner in my non-stretchy linen, but “going round” rather than mitering does make the ends of the stole flare out a bit. If I were to knit this again, I’d work out a complementary mitered or fixed piece corner instead of just easing the edging around. If you are thinking of working this pattern, too, I did post a minor bit of errata for the original pattern. My own Jang Wave will be headed out as a present for a family member. 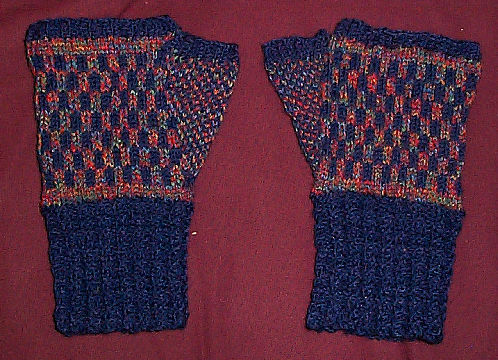 These were adapted from my previously shared Fingerless Whatevers pattern. Although they’ve missed the worst of winter’s weather, they’re on their way. Finally – a private note to friend-from-elder-days, Wendy. I tried leaving a comment on your blog about your offer of the ancient photo, to no avail. I’d love to see the thing. I might even have one of you (of similar vintage) in trade. All my best to the family, two and four-footed, alike. Back from a business trip, I exhibit productivity. I was able to get work in during the plane rides and layovers. 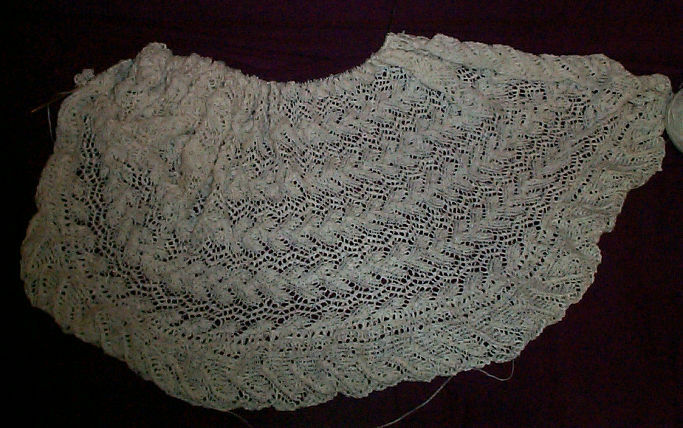 I’ve managed to get quite a bit further along on the Wave scarf’s edging: Overall, if I were to do this pattern again instead of following it verbatim, I’d change the ratio of attachment to make it a bit less ruffly, and I’d up the rate of attachment at the corners to diminish the cupping that occurs at the corners. These things might have been less in evidence if I had chosen a wool yarn for my stole. I used linen, with very little stretch. When you use an unstretchy cotton, silk, or linen yarn for a pattern written out for wool, you need to be much more precise in the rate of attachment and in working the corners because you can’t rely on natural elasticity to even out tight or loose bits. Obviously aggressive blocking is called for here, even though it will be only partly successful. As to where I went and what I did – if you saw a tall gal with glasses and short dark hair knitting on this project in Logan, Chicago Midway or Dallas/Ft. Worth airports over the weekend – that was me. Back to the Print o’ the Wave scarf/stole. I didn’t have enough time to sit down and noodle out a hat last night. Invention tends to happen over the weekends here at string. Instead I continued on with the knit-on edging. I’m within an hour or so of completing the second side and working the second corner. At that point I’ll be about half done, as I began my edging pretty close to the first corner. The thing looks wing-shaped because I’ve got a zillion remaining live stitches picked up around the circumference all on a single circular. Aside from the error in the chart described before, I’ve experienced no problems with the edging. 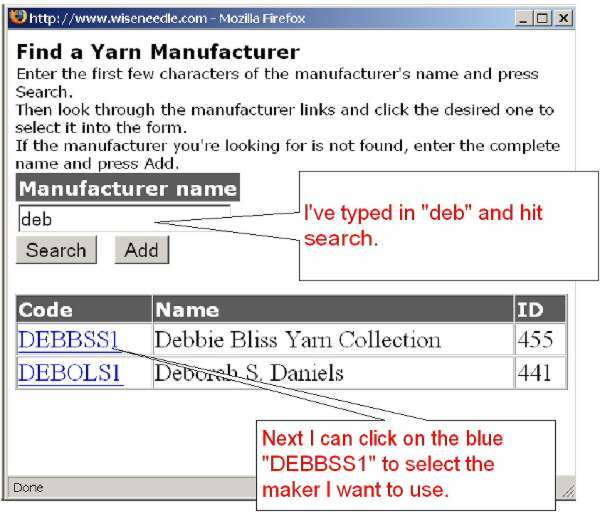 It’s taking forever, but if you’re a process knitter like me, that’s a design feature, not a bug. The only remaining debate about this piece is to whom I will give it as a holiday present. Back to the project in hand. I’m up to adding the edging to the Print o’ the Wave scarf, which in part sparked the past two days’ digression into general edge-affixing techniques. I am sad to say I have errata for the pattern as available now. I wrote to the author over the weekend to report it. 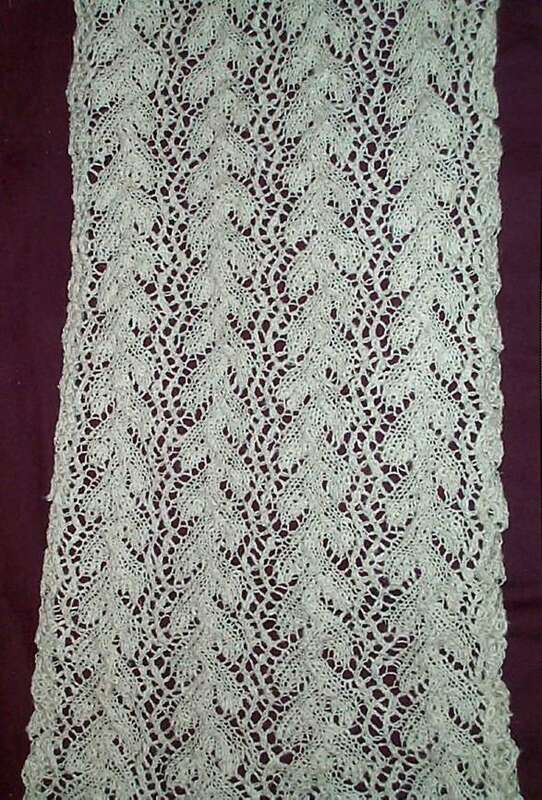 While the mistake is not something that will trip up people who are comfortable with lace construction, people doing this scarf as a first or second lace project will be a bit more frustrated. In Chart B – the graph for the edging, the next to last stitch box on rows 9, 11, 13, and 15 should be a K2tog, not a plain knit. 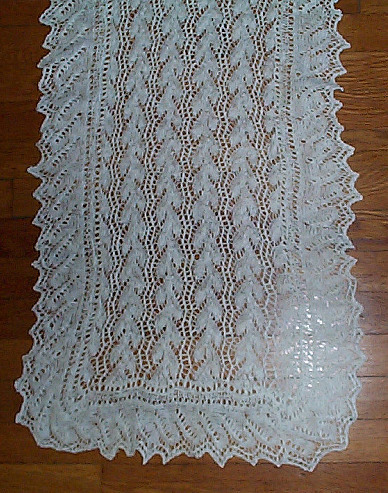 A good way to “proof” graphed lace patterns is described in the Lewis Knitting Lace Book published by Taunton. It’s in several others, too but I think Lewis outlined it the most clearly. 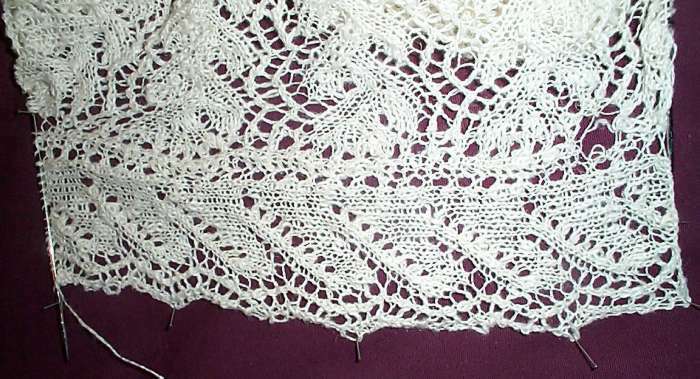 To paraphrase, special techniques and weird row-perturbers aside,, for most simple lace to remain at a constant width, with left and right edges parallel, the number of stitches increased must equal the number of stitches decreased. 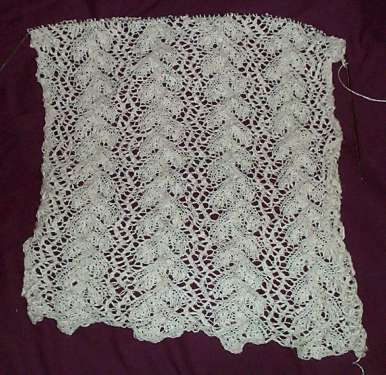 For lace to grow wider, there must be more increases than decreases. 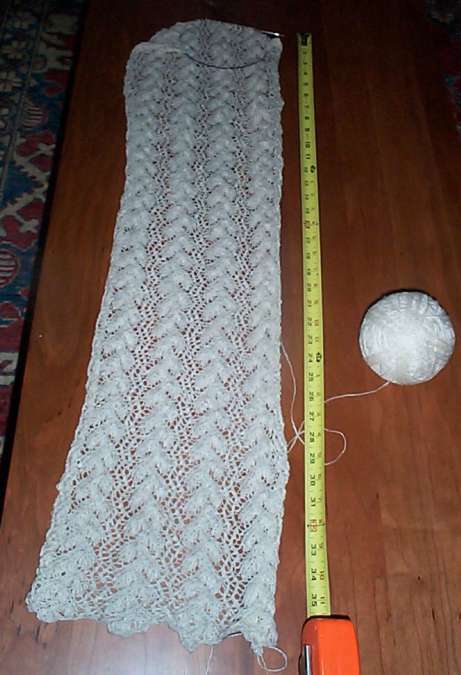 Conversely, for lace to narrow, there must be more decreases than increases. On the edging in question, we know that rows 9, 11, 13, and 15 are the ones on which the pattern narrows, forming the “downhill” side of each repeat’s gentle pyramid point. But if you count up the increases and decreases on (for example) row 9, you end up with four stitches added (all YO increases), and four stitches decremented (two k2tog, and one k3tog double decrease); yet the pattern shows a net one-stitch loss on each odd numbered row. Since the visual lines established in the design are very strong, there’s only one logical place where that extra stitch can be lost – the next to last position on the row. I have to admit that I was a bit tired when I first played with the edging pattern and kept messing up. But I muddled through, and then compared this variant of the Ocean edging to those in my other reference books (most notably the most excellent Heirloom Knitting by Sharon Miller). Those patterns do put an additional decrease in the penultimate position on each “downhill” row, so my guess has precedent. All that muddling about at the beginning, starting the trim and ripping it back resulted in a dropped stitch over near the beginning of the edging (I’m working along the top edge of the stole first). Aaargh! I don’t want to rip back, so I’ll have to repair it tonight. As you can see, I’m making progress on my Print of the Wave scarf/stole thing. It’s roughly 24 inches long. I figure I’m a tad under half-way home. I am now contemplating whether or not I want to do the center back graft thing recommended by the author. The advantage is that the highly directional orientation of this texture design would then present the same way on both ends when worn. They’d match, with the vine-like bits growing up from the each end. On the other hand, there would be a noticeable seam across the center back – another area of visual focus. And the jury is still out on how to edge the piece. 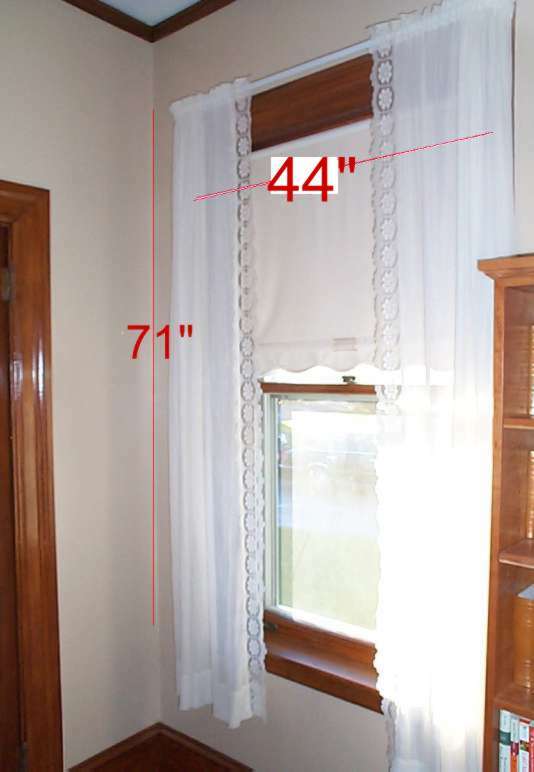 Part of me says that working the narrow complementary edging specified in the pattern would be quick and easy. And part of me says “Easy. Heck. Just think of the challenge of edging the thing with an 8-inch wide mitered border using at least three different stitch designs and THEN putting on an edging.” We’ll see which one prevails – sense or the lack thereof. As an aside – if you’ve had problems with sporadic access to this site or leaving comments here, please send me a note at admin [at] wiseneedle [dot] com. I know that moving is disruptive and that when you move part of the audience is lost, but the silence here is deafening. Of course shouting out “Where did everyone go?” in an empty field is an exercise in absurdity. Sort of like thinking about adding a complex 8-inch border to what amounts to a spur of the moment knitting doodle. In any case, a safe, healthy and prosperous New Year to all! On election day most polling places in the US are in public buildings – very often county, town, or city-run schools. School parent committees see all that foot traffic as opportunity, so on most election days they mobilize as many parents as possible to make edible goodies to sell as fund raisers – always with some lofty goal or another. Send the band to the regional competition; refurbish worn-out playground equipment; send supplies to a sister school in a disadvantaged area; buy books for the library, a van to transport special needs children, robes for the choir, violins for the orchestra, or uniforms for the sports teams- the list is endless and every cause is deserving. Most often it’s hapless non-baker moms who are dragooned, and interminable plates of cake mix brownies and slice-to-bake chocolate chip cookies are prepared by those with generous hearts and more volunteer spirit than time or baking knowledge to spare. Zucchini (vegetable marrow) season is especially feared because of the flood of zucchini breads and muffins that overflow the sale tables. I don’t think there’s a parent of a school age child in the US who has not heard “Oh, and we need to bring something to school today for the bake sale” ten minutes before the bell rings. You can find those parents buying cupcakes at supermarket bakeries on most bake sale mornings. Needless to say, it’s local/state election day tomorrow and the clarion call for cookies has been made. This time around I made icebox cookies: half and halfs – chocolate and cinnamon. Seven dozen. On a work night. Thankfully I had advance warning and mixed the dough and refrigerated it on Saturday. Which explains in part why time was at a premium this weekend past. Even so, I’m cookied out. Working with this linen of forgotten provenance is interesting. It’s relatively soft – no sharp bits of cuticle like some linens I’ve used. There are some fluffy slub like areas, and some places where the stuff is sewing thread fine. I am not having any problems working the lace pattern in it, and the result is surprisingly soft for something as slash-your-fingers-before-breaking durable as the the yarn actually is. I’ve got a ton of it. My foot or so of lace has made no discernible dent in the ball. Well, it’s obvious that talking about wiseNeedle is a sure-fire way to keep people away from this blog, so I’ll give the topic a rest. Back to knitting. I’m swamped again at work so discretionary knit time is at a premium, but I did manage to cast on for a Print o’ The Wave scarf. 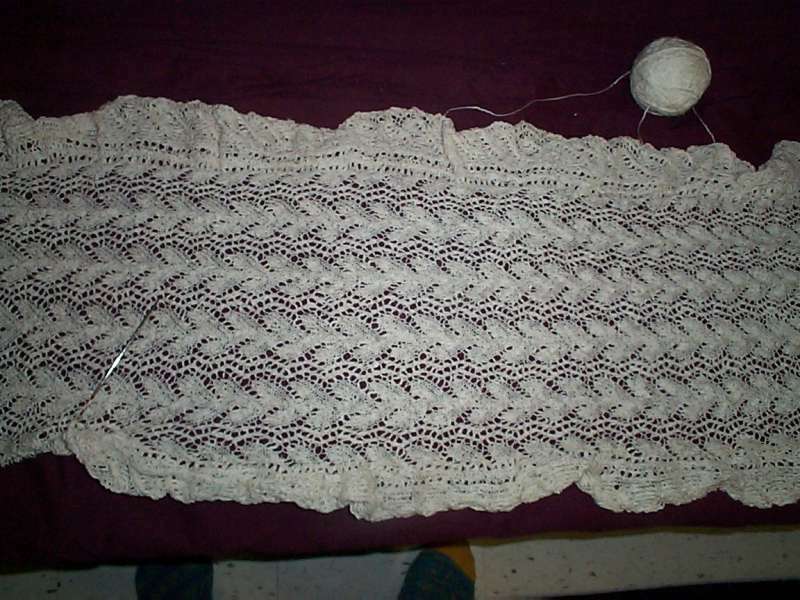 The body pattern is relatively simple – a 12 row 16 stitch repeat, with half-drop symmetry. That means there’s only three substantive rows to memorize, plus the fact that after three rows they’re repeated with an 8 stitch offset. I’m not sure whether or not I’ll bother with the author’s specifications for grafting two pieces together in the middle thing to make the two ends symmetrical. Perhaps instead I’ll just pick up stitches and work out in the other direction. Or maybe I’ll just keep going. It depends on how mindless everything end up being and how bored I get without other sections or pattern changes to look forward to. The yarn is a nameless lace-weight linen I bought aeons ago at a Maryland Sheep and Wool Festival. You can see some of the texturing it has if you click on the thumbnail above to pull up the larger image. No stretch in the stuff of course, which will make blocking interesting, but it’s butter soft. I’d estimate that it’s about 15 inches across with minimal on-needle smoothing out. I have to admit that one of the reasons I like complex lace knitting is that there’s always something interesting and new happening. It’s fun to watch the pattern build row by row, accumulating each new texture and design. This scarf by contrast is a long strip of a single stitch pattern. We’ll see how I as a knitter with the attention span of a mayfly handle this challenge to perseverance. 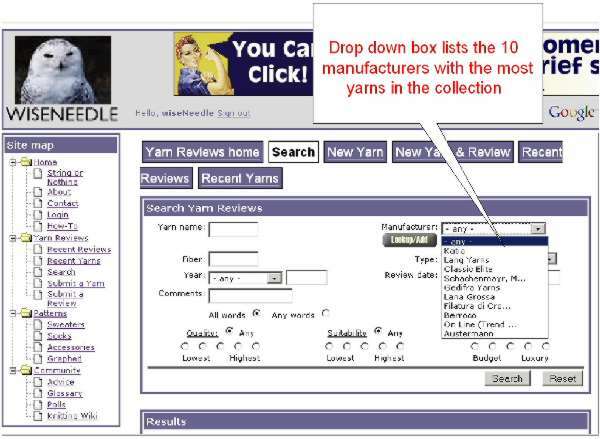 On the domestic front, my Heirloom Knitting book is still AWOL and I’m at sixes and sevens over it. I wish I could blame Franklin’s Delores, but she was no where near Boston during the week it disappeared. Besides, she’s not my hallucination. I’ll have to get both more creative and entertaining before I come up with an excuse half as amusingly incorrigible.